When I teach seminars or do presentations, it’s a two-way street. While I’m the one standing in front of the room sharing my knowledge with attendees, I am also the one that picks up a new tip or technique from someone in attendance. That is one of the things about woodworking that I enjoy so much. Not any one woodworker knows it all. Every day there is something to learn. These past couple weeks, at least around my woodworking world, there have been talks about how to remove plating from hardware. Since day one I’ve been turning store-bought hardware from shiny to dull black using gun bluing. My hardware store use to carry the product, but that is no longer the case. These days I travel to one of the bigger outfitter-type stores, trudge to the gun area and pick up four or five small bottles at a time. Those days my be over, too. For the first time in nearly twenty years, I heard – it’s possible that I heard this before, but did not pay attention – that many woodworkers dull their hardware using regular household white vinegar. Yeah, right. 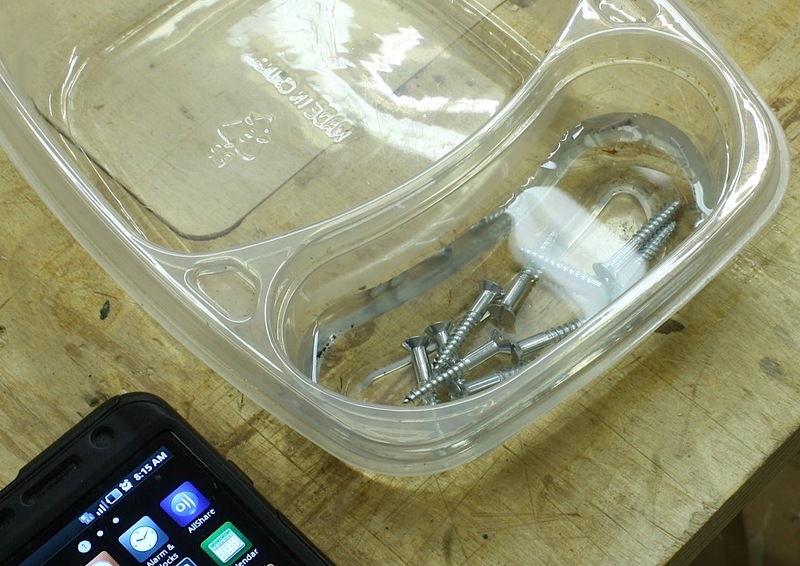 I had to give it a try, so yesterday morning I pored vinegar over some of my plated screws. I established the time because I thought it might take days to get the plating off. A hour later, I had bare screws. See the results in the photo, just above. I dumped the screws from the vinegar, patted them dry then laid them out on my bench. The plating was off, sure enough. But the look wasn’t exactly what I expected – where was that black appearance? Funny thing, though. As the screws sat exposed to the air, a small amount of rust appeared. That added to the look. In the photo below I have two sets of stripped screws. The black screws, of course, are those that took a gun-bluing bath. 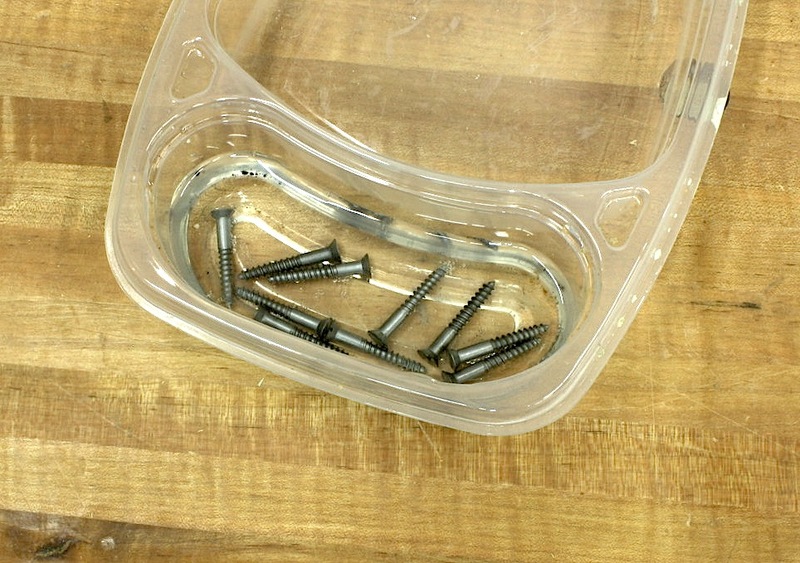 On the right are screws stripped using vinegar. I am still torn between black and rusty. 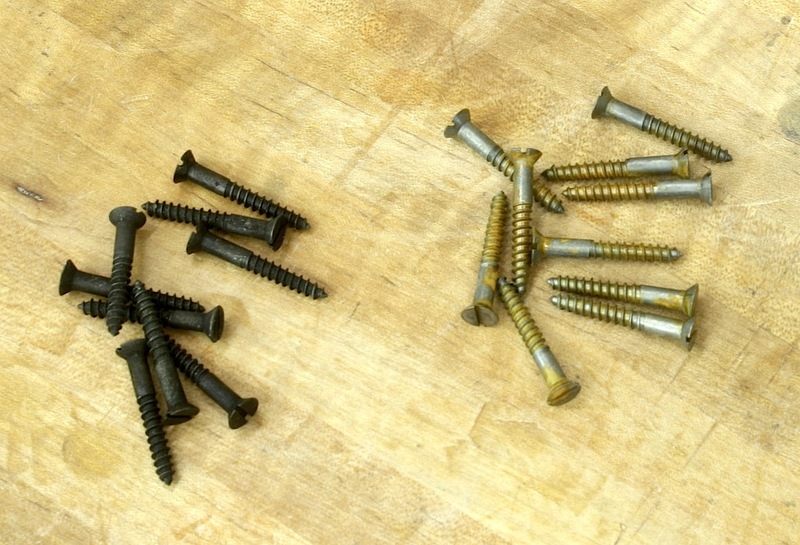 Which screws do you think better represent antique screws? Which are better to use when building reproduction furniture? If you’re interested in reproduction furniture, I have three project DVDs available (click here for information). All three use slot-head screws somewhere during the build. I much prefer the look of the gun blued screws. Hi Glen. I have used white vinegar in the past to strip hardware. My results don’t look like yours however. My screws get more of a gray color. I do leave them in the vinegar much longer perhaps a day or two. I then dry them and give them a squirt of WD-40 and don’t recall getting any rust.